Say instead: Fino, manzanilla, amontillado, palo cortado, oloroso… Can any other wine style or region boast such a splendid quintet of evocative, mellifluous names as this? Roll them on your tongue, savour them, hear how they resonate. To lump them all together under the prosaic term ‘sherry’ seems such a travesty. More than that, it is a commercial tragedy, for the name sherry has become so debased, so associated with fuddy-duddy, stick-in-the-mud images that people reject it without ever letting a glass near their lips. 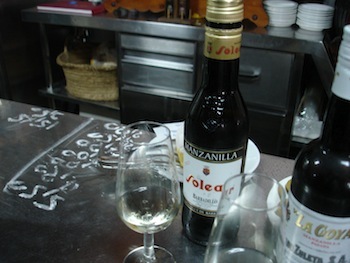 Hence I use the generic term as little as possible and try instead to talk of a glass of fino or oloroso when referring to the famous wine of Jerez, way down in the south west corner of Spain. There is nothing simple when it comes to considering all the different styles and categories of sherry and perhaps that is part of its problem. Every time I have visited the region I have been treated to labyrinthine explanations of its classification system, yet would still not claim to fully understand it all. We need not concern ourselves with those intricacies here and will keep the focus firmly on fino and oloroso. Both of these start out life as humble wines of no distinction made from the Palomino grape. The best come from those vineyards planted on the region’s famed albariza soil – pale grey, dusty and eye-searingly bright under a relentless midday sun. After fermentation the wines are assessed and graded. Those whose character is delicate and fine are destined to become finos while the coarser, more robust wines are set to become olorosos. At this stage both are fortified by the addition of grape spirit, the finos to about 15 per cent and the olorosos to about 18 per cent. It is at this point that sherry begins its long journey from humble origins to exalted pre-eminence as one of the world’s greatest wines. The wine is transferred to large barrels or butts with a capacity of about 600 litres and, critically, they are not filled to the top. A significant proportion remains empty so as to leave the wine in contact with air, a practice that would gain no favour in other wine regions. Nor is a barrel filled from empty with young wine. Rather, the youngster becomes part of the solera system. This is a complicated system of fractional blending used to ensure consistency of style from one year to the next, indeed, from one decade to the next. 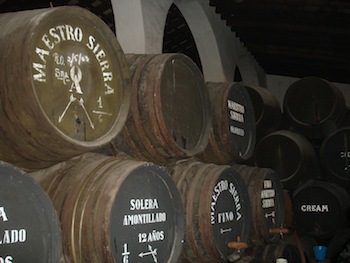 A solera consists of perhaps a couple of hundred barrels arranged into ranks or tiers. Wine for bottling is drawn only from the oldest tier and this deficit is made up from the next oldest and so on until the deficit in the youngest tier is replaced by the new wine. No barrel is ever emptied of all its contents; usually no more than one-third is removed at any one time. Thus a well cared for solera should have an unlimited life span and it is indeed possible to come across ones that have been in existence for well over 100 years. All of this happens in the ‘cathedrals’ of Jerez, the vast, high-ceilinged bodegas, each of which house thousands of blackened oak barrels and their precious cargo of wine. Outside on a summer’s day the sunlight dazzles off the bright white exteriors while inside the bodegas are hushed and remarkably cool. The earthen floor absorbs the sound of your footfall while your eyes struggle to adjust to the dim light. As you walk between the ranks of barrels, stacked perhaps five high, the atmosphere is timeless and peaceful and, after a while, you find yourself coming into step with it. The pace slows and your voice drops a few decibels. There is an enticing, slightly pungent aroma that you can’t quite pin down. Wine, oak and earth combine to tantalise the nostrils. It is time to taste. 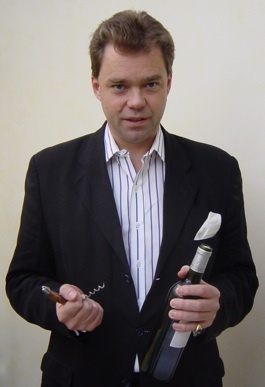 Luckily the cellar master is standing by, armed with his venencia, a slim metal cup with a long flexible handle attached. He plunges it into a barrel to extract a sample and then pours it masterfully from a great height into your copita. The stream of liquid twinkles and sparkles – pale lime for fino, deep amber for oloroso. 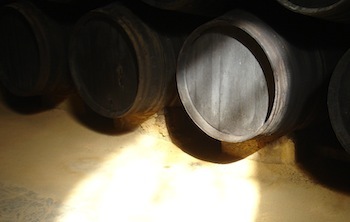 The wine from barrel is cool and in the case of fino, remarkably fresh. Indeed it is hard to fathom that something so lean, austere even, can be produced in a region whose summers are unremittingly hot. In the best finos the savoury freshness is enhanced by a whisper of nutty richness, almonds perhaps. It is this savoury, nutty character that links fino to its polar opposite in style, oloroso, where the flavour is altogether more intense. The tiniest sip of a good oloroso, when savoured for a few moments, will reveal nuances and layers of flavour that few other wines can match. Just like fino it is also bone dry but may be sweetened before bottling by the addition of some thick, treacly-sweet wine made from the Pedro Ximenez grape. When just a touch is added to an oloroso it helps to leaven an intensity that can sometimes be searing, rounding out the hard edges as it were. Picture the scene: I am 10 years of age and have just returned home from school. My mother is eating some green olives with undisguised relish. I have never eaten, nor even seen, one before but hey, the colour, shape and size are remarkably similar to a green grape so I assume that the flavour will also be similar. How wrong I am! I can still remember the shock as the salty, savoury taste exploded on my palate, puckering my face into a grimace. If you have never drunk fino sherry before and are more used to juicy ‘n’ fruity whites, or reds enriched with a touch of oak, then your first taste is going to be remarkably akin to my first olive. The flavour is savoury and fresh, dry as a bone and, just like olives, once you acquire a taste for it you will never be happy with anything else. 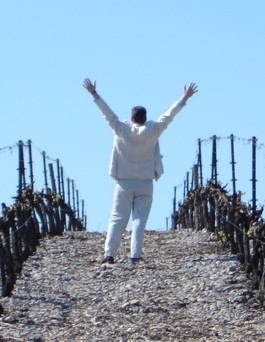 So be prepared to persevere with what is probably the best value fine wine on the planet.